One of the oldest settlements in the U.S. is historic St. Augustine, Florida. The rich heritage here is worth some time spent devouring the sights and sounds, the fascinating ambiance and the landmarks. Of course the beaches are also a major attraction any time of year. And there is a lot more than just history to bring you here! Read on! You will have a wide choice of RV parks so you can remain for a time to explore. One that comes highly recommended is the Stage Coach RV Park. This park is close to all the places you have on your itinerary for St. Augustine. You’ll find full hookups and a relaxing atmosphere. Check out Ponce de Leon’s Fountain of Youth while here. Get a tour and discover the area that Juan Ponce de Leon found in 1513. This area has such a rich history. The Archaeological Park is an entertaining sight for the whole family. This is the spot where America began, settled years before Jamestown and even before the Pilgrims landed. The oldest structure in St. Augustine is the Castillo de San Marcos National Monument. See some re-enactments of history as people dress in the costumes of days gone by and show you what life was really like in those early days. Be sure to allow at least one or two hours for your visit so you can see everything possible. Enjoy exhibits and walk through the fortress. There are also Ranger Programs where you can learn so much of the history connected with this most fascinating place. Next comes the St. Augustine Lighthouse & Museum where you may wish to get some exercise and climb the steps to the top. Fabulous views can be enjoyed from the top of the lighthouse. Learn the story of this nation’s oldest port. This lighthouse is now in the spot where a Spanish watchtower once stood. The watchtower was the first lighthouse in Florida, protecting ships beginning in 1824. The outdoors beckons at Anastasia State Park. There are so many activities here, such as hiking, walking self-guided nature trails or watching all the wildlife. The tidal marshes are home to a wide variety of life. Theses marshes are also a great place to paddle. RV camping is available, close to the beach and all the fun. If you are a real history buff, you’ll love the Lightner Museum with the amazing collections of costumes, furnishings and more from the 19th century. See beautiful cut glass and some wonderful samples of Tiffany stained glass. Naturally, you want to see an alligator farm and you can experience all the magic of this part of our animal kingdom at St. Augustine Alligator Farm Zoological Park. Not just alligators, but tropical birds, crocodiles and lemurs will be there. You can see it all from the tree tops if you opt to ride the zip line. See a show or two. The fun is truly never-ending. 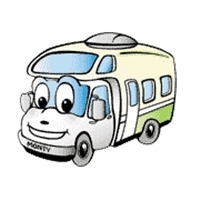 If you’re interested in booking an RV trip in St. Augustine, FL, El Monte RV has an RV pick-up location in Orlando, FL. Picture credits: The picture of a Flagler College in St. Augustine, FL is from the Wikimedia Commons. It is licensed under the Creative Commons Attribution-Share Alike 3.0 Unported license. This entry was posted in Florida RV Camping Vacation, Lighthouses. Bookmark the permalink.